I remember when I first fell in love with Instapaper. It was a few years ago, and most people were still using Delicious or worse, their browsers, to bookmark things on the web. Delicious was still solid at the time, but it was also pretty slow. Instapaper was wonderful because it was fast. You hit one button (a bookmarklet) and it saved an article to read later. The reality is that the service hasn’t changed all that much over the years. But the iPhone and now iPad have transformed it from being a useful service into an essential one. And it has grown into a big enough business where creator Marco Arment was able to leave his job as CTO of Tumblr to focus on it full time. And now we’re seeing the fruits of that. Instapaper 3.0 is a massive update. 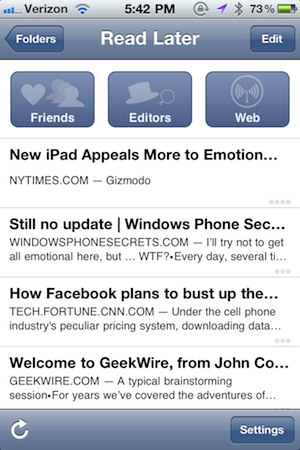 The iPhone, iPad, and web interfaces have all been updated to include the big new aspect of the service: social. 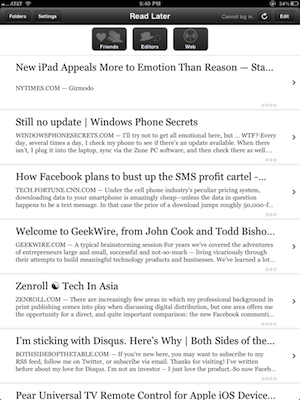 You can now easily share things you Instapaper to Facebook, Twitter, Tumblr, Pinboard, and Evernote. Once you link up your Instapaper account to each, you’ll see an option to automatically share stories you “like”. And that another big new feature: Likes. It used to be that you could “star” stories you have saved to further mark them as important. But it was never really clear how useful that feature actually was. But now “likes” are directly tied to the sharing aspect — not only sharing to other networks, but also within Instapaper itself. The service now has a social layer that allows you to subscribe to Likes shared by other users you know (you find them via your contact list or the other social networks). Previously, there was a way to subscribe to other users’ Instapaper feeds if they were public, but it wasn’t very obvious how you did that. Now there’s a nice big “Friends” button at the top of the app. There’s also a new “Editors” button which allows you to find new curated content from the likes of Longreads, Longform.org, and Instapaper’s own “Editor’s Picks”. And finally, there’s also a new “Web” button along the top of the app to allow you to browse websites you like and mark things to read later. In his post on the new release, Arment also notes a half dozen other upgrades in Instapaper 3.0. Image quality is better, downloads happen faster, and other settings have been tweaked. The biggest of these other changes is the ability to search the content of downloaded articles. Arment notes that this isn’t website-enabled yet for the entire archive of content you’ve saved, but he hints that that may well be coming. 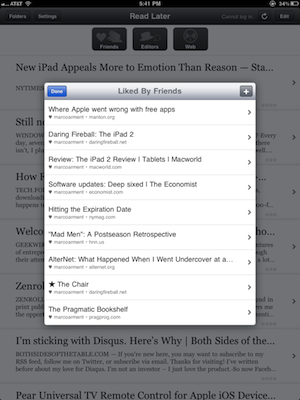 You can find Instapaper in the App Store here. 3.0 is a free upgrade for existing users of the Pro version, otherwise it’s $4.99 — well worth it.